You can secure any car with a tow dolly. This enables you to take it where ever you want and use it at your convenience. A two dolly is often placed on the trailer hitch of an RV when a car needs to be brought along. Dollies are useful and easy to attach and detach a vehicle for towing purposes. 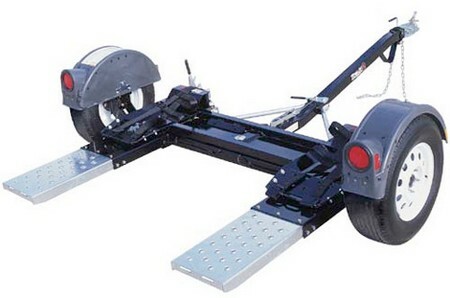 Tow dollies are designed to lock onto trailer hitches. Hold the dolly by the handle just in back of the hitch coupler. Turn the hand rotator counterclockwise, or left the lever to open the coupler. Place the coupler over the hitch ball. Secure the hand rotator by rotating clockwise, or lower the handle. Make sure the dolly is locked into the hitch. Pull the dolly to verufy that is is secure. Apply safety chains. Pull chains from the front of dolly in the direction of the vehicle. Cross the chains under the hitch connection. Place the hooks in the slots on both sides of the hitch. Leave some give in the chains but they shouldn’t drag. You need towing lights. A tow dolly has rear lights that is powered by the signal from your vehicle. The dolly connector should be plugged into the socket at the rear of the vehicle. Check the lights to make sure they are functional. Lower the drive-up ramps. Release individual ramps by pulling the lock pins then moving the ramps towards the rear.The hinges will allow the ramp to slide into position.Release the pin at the rear of the attachment bar. The rear end of the dolly will tilt the ramps down. Drive the car up the ramps. Drive the car toon the dolly until the front tires rest in the wheel stops. Shift the car in “Park,” or low gear. Put your parking brake on. Secure the ramps. Lock the pin for the platform. If your dolly has individual ramps, lift them until they are level with the dolly. Place them into their holding sleeves. The spring-loaded pins need to be locked in position. Secure the safety chains from the dolly. Loop the chains around the frame of vehicle. Leave some slack. Place the clasps through a link. Lock you steering wheel. Release parking brake. Car should be in neutral gear. Remove your keys from the car and lock all doors.